So one of the things that is obviously important for the massage therapist on a regular basis is taking care of oneself. It is especially important here on the tennis circuit as days are long, anywhere from 9 – 16 hours. Now some of that is taken up with the start the day meetings and then there is the writing of notes. Yet you can have your hands on someone for a good 7-9 hours in a day between the scheduled massage sessions and the spot work in the training room. Self-care becomes essential. That and good sleep! A bit of exercise if you have the stamina! Zippy comes in quite handy for the self-care part. As a matter of fact, this is one of the reasons the Zip is on this trip in the quantities I am carrying. 50 of them. Zip will be showing a group of young tennis athletes some easy ways to take care of themselves off the court as part of a presentation I will be giving to the WTA Future Stars program. Here you see Zippy demonstrating various ways to reduce some the tension throughout various muscle groups. It is a nice tool for this because of its ease to hold on to. Often as we try doing self-massage the area that we are working feels good but the hand we are doing it with starts to hurt because we cannot use very good body mechanics. Zippy fits nicely into your hand and gives the opportunity for both kneading the muscle with its roller ball or stripping and scrapping the muscle with its flat end. Its shape allows for easy use with little to no stress on the treating hand and forearm. Try some out on yourself if you haven’t already! It feels ‘oh so good’. Here we are demoing through the clothes but used directly on the soft tissue (with or without a bit of lotion) feels great. Here we are using Zippy with the gastric/soleus and then it feels great along the ITB. 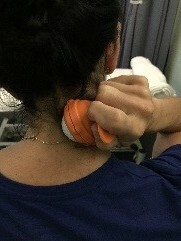 Use it through the quads and even into the neck. When you add some active movement as you work this tissue it enhances the effects even more! These are some of the techniques that will be shared with the Future Stars kids. But we still have work (and some play) here in Beijing. So keep an eye out for Zippys’ further adventures in Asia. I see some sight-seeing in its future! Zippy on the road Again!